Thank you for your interest in Fancy Works! We are a small, woman-owed business located in South Central Indiana. We are here for your needlework shops throughout the needles. We currently are slowly adding inventory to our online store, so if you don't see what you are looking for, please give us a call or email! "This is the most welcoming, friendly and helpful Stitching store. The owner, Diana, is a delight. Tuesday is a stitch-in at the store, which was the day I dropped in. 4 hours later lots of goodies bought and new friendships made. I encourage you to pop in if you are in the area. Or call and place an order with them , they are awesome on shipping items also. Thank you Fancy Works for making my visit so wonderful." Debbie S.
"I love Fancy Works! Everyone is so helpful. 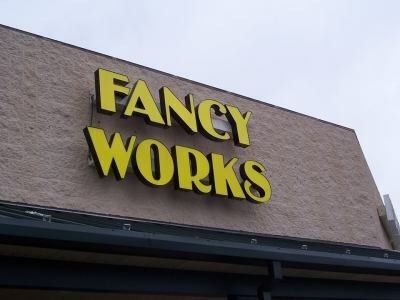 Whether it is helping me with gathering the right materials for a project or just giving me tips and tricks, Fancy Works is always there to help! I also love the variety of projects they carry in the store. If there is something you want but don't see in the store, they will kindly order it for you and call you when it gets in. Keep up the good work." Kaitlyn S.